Six cars were involved in a series of collisions this morning on the A27 near Fishbourne Roundabout, police have confirmed. Two single vehicle crashes within minutes of each other were followed by a four-vehicle accident on the eastbound carriageway, with reports at 5.40am, 5.50am and 6.40am. Severe delays have now eased on the eastbound A27 approaching Fishbourne. Traffic towards Chichester faced two hours of delays in queues as far as Havant. A spokesperson for Sussex Police said no one appeared to have been seriously injured in either crash. Chris Owen, features editor at the Observer’s sister paper, The News, in Portsmouth, was among those to pass the scene of the crash. He said: “It was carnage. I have seen bad accidents on that stretch of road before but nothing like this. “I counted at least five ambulances, three fire engines and number of police – too many to count. “The vehicles that I saw were wrecked. Sussex Police provided statements for all three crashes, the first two of which happened independently of each other on the A27 just west of Fishbourne roundabout, within 11 minutes of each other. A police spokesman said: “Heavy rain was believed to have caused the vehicles to aquaplane and leave the carriageway, crashing into undergrowth. Both drivers suffered shock. “The first incident was reported at 5.38am and involved a blue MG ZR, and the second, involving a silver Peugeot 407, came in at 5.49am. “Both cars were heading towards Portsmouth. 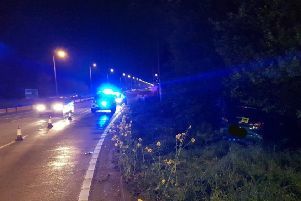 “At 6.38am on Thursday (March 8) emergency services were called to a four-vehicle collision on the A27 eastbound near the Fishbourne Roundabout, Chichester. “Five people from the various vehicles were injured, though none were believed to have been seriously hurt. “The vehicles involved were a grey Peugeot 308, a white Ford Transit panel van, a red Volkswagen Golf and a blue Ford Fiesta.